Overall, it's tastes exactly like you'd expect. There's creamy vanilla ice cream, a fairly thick chocolate coating, and almond bits throughout the shell. 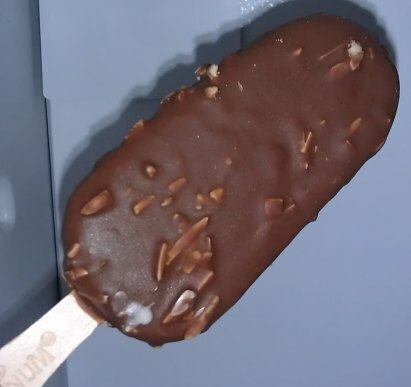 When I first had Magnum Classic, I thought there was a subtle hint of nuttiness. Here on the flip-side, I find the almond surprisingly laid back. 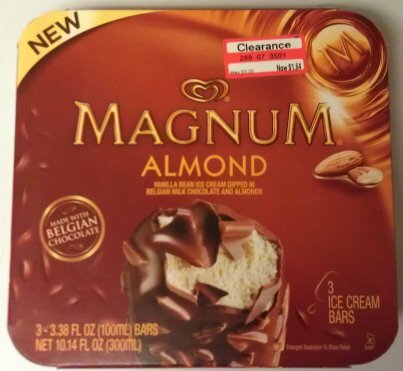 Rather than striking out on it's own, the almond flavor serves to subtly tie the whole treat together. It's nothing crazy, but it totally works this way. Nice job. I'm a big fan of these. At first I didn't like it, but after a few more bites, I fell in love. There must be a lot of people like that fall in love, because the review I did on my blog was one of the most trafficked posts I've ever had. Be on the lookout for the big surge! Good to know you have the same opinion as I did when I emailed you forever ago about it. my bad! took me forever to finally pick these up! It's no double shelled magnum, but yeah, it just seems to work. Agreed, if you are talking about the Double Caramel bar. I've got a review coming for that in the future and let's just say it will be very positive. I love these bars but not as much as I love the double caramel kind. But mostly I just had to comment because I am so jealous you got these on clearance at Target! Ours aren't on clearance but I wish they were. Haven't tried these yet but, I got mine at the 99 cents store!